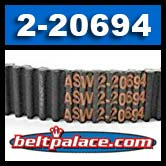 ASW 2-20694 CVT Replacement Belt. Comet Industries OEM SPEC for ASW. 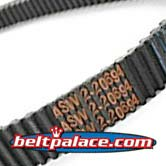 Home > CVTech - ASW CVT Drive Belts > ASW 2-20694 CVT Belt. Landmaster, Manco 2-20694. American Landmaster 2-20694 CV Tech Belt - UTV. Genuine ASW part. Manco/American Sportworks (ASW) 2-20694 CVT Belt. 2-20694: BELT, CV TECH-NEW UTV's. Drive belt for Chuck Wagon CW-11/CW-13 with CVTech torque converters... CW-11 Serial 25663 & later with Honda motor. Includes select Trail Master and Land Master UTV's. "Double Cog" belt. 20694 Belt, Kevlar (Aramid) reinforced.